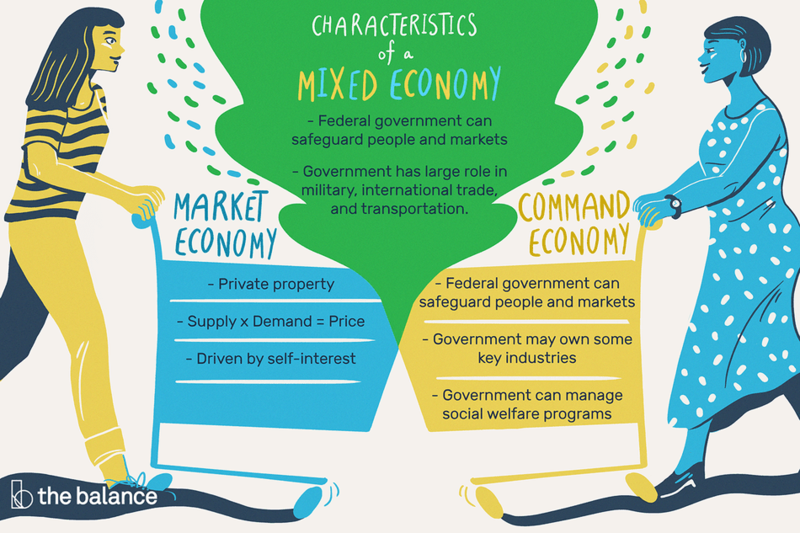 A mixed economy is a system that combines characteristics of market, command and traditional economies. It benefits from the advantages of all three while suffering from few of the disadvantages. A mixed economy has three of the following characteristics of a market economy. First, it protects private property. Second, it allows the free market and the laws of supply and demand to determine prices. Third, it is driven by the motivation of the self-interest of individuals. A mixed economy has some characteristics of a command economy in strategic areas. It allows the federal government to safeguard its people and its market. The government has a large role in the military, international trade and national transportation. The government’s role in other areas depends on the priorities of the citizens. In some, the government creates a central plan that guides the economy. Other mixed economies allow the government to own key industries. These include aerospace, energy production, and even banking. The government may also manage health care, welfare, and retirement programs. Most mixed economies retain characteristics of a traditional economy, but those traditions don't guide how the economy functions. The traditions are so ingrained that the people aren’t even aware of them. For example, they still fund royal families. Others invest in hunting and fishing. A mixed economy has all the advantages of a market economy. First, it distributes goods and services to where they are most needed. It allows prices to measure supply and demand. Second, it rewards the most efficient producers with the highest profit. That means customers get the best value for their dollar. Third, it encourages innovation to meet customer needs more creatively, cheaply or efficiently. Fourth, it automatically allocates capital to the most innovative and efficient producers. They, in turn, can invest the capital in more businesses like them. A mixed economy also minimizes the disadvantages of a market economy. A market economy could neglect areas like defense, technology, and aerospace. A larger governmental role allows fast mobilization to these priority areas. The expanded government role also makes sure less competitive members receive care. That overcomes one of the disadvantages of a pure market economy which only rewards those who are most competitive or innovative. Those who can't compete remain at risk. A mixed economy can also take on all the disadvantages of the other types of economies. It just depends on which characteristics the mixed economy emphasizes. For example, if the market has too much freedom, it can leave the less competitive members of society without any government support. However,​ central planning of government industries also creates problems. The defense industry could become a government-subsidized monopoly or oligarchy system. That could put the country into debt, slowing down economic growth in the long run. Successful businesses can lobby the government for more subsidies and tax breaks. The government could protect the free market so much that it doesn’t regulate enough. For example, businesses that took on too much risk could receive taxpayer-funded bailouts. The United States Constitution established a mixed economy. It protects ownership of private property. It also limits government interference in business operations. That promotes the innovation that's a hallmark of a market economy. At the same time, the Constitution encourages the government to promote general welfare. That creates the ability to use aspects of a command economy where needed. The Constitution also protects the rights of groups to practice their customary beliefs. For example, the Amish in Pennsylvania continue their traditional economy. Most of the world's major economies are now mixed economies. Globalization makes it difficult to avoid. A country's people are best served through international trade. It’s smart to import oil from Saudi Arabia, clothing from China and tequila from Mexico. When a country encourages its businesses to export, it gives up some control. Second, the free market is the basis for the global economy. That's because no single government controls it. World organizations have implemented some regulations and agreements, but no world government has the power to create a global command economy. A market economy has six defining characteristics. The United States has all six characteristics of a market economy. First, the law protects ownership of private property. Second, everyone is free to live, work, produce, buy and sell whatever they choose (as long as it's legal.) Third, self-interest drives the buying and selling of goods and services, including employment. Sellers want the highest price and buyers want the best value for their money. Fourth, the law protects competition. Fifth, prices are allowed to float along with supply and demand. Sixth, the primary role of government is to make sure that everyone has free access to a free market. Congress passes regulations to make sure no one is manipulating the market. The Constitution protects the free press to give everyone equal access to information. Many aspects of the U.S. economy follow the characteristics of a command economy. First, there is an annual federal budget that outlines the government's priorities and takes the place of a central plan. Second, Congress guides the allocation of resources. Taxes discourage some activities while subsidies encourage others. Third, government spending follows the priorities for the country. For example, U.S. military spending increased after the 9/11 terrorist attacks. Fourth, the government owns a monopoly in important national industries. These include NASA, the interstate highway system, and defense. Fifth, the federal government uses regulations to support economic priorities, such as agriculture. The United States is moving further away from a traditional economy, but tradition still guides many economic policies. First, a traditional economy relies on agriculture, hunting, and fishing. American traditions support the family farm. That has led to millions in agricultural subsidies. This is despite the predominance of a few global agribusinesses. Laws and treaties also protect the fishing industry. Hunting is no longer needed as a primary source of food for America, but tradition still supports it. Laws and permits protect the right to hunt.